Apparently, PBS.org was hacked yesterday by a "hacktivist group" called Lulz Security. 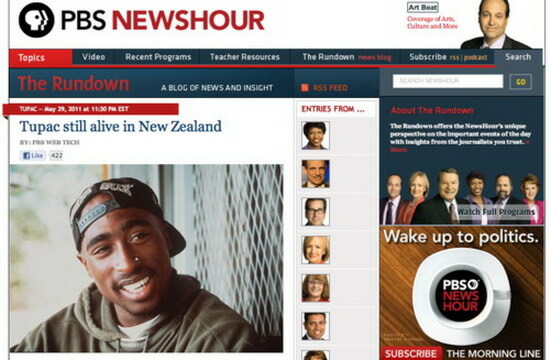 They published an article on the site's rundown blog according to which Tupac is alive and well and hanging out with Biggie Smalls (another rapper)(sic!) down in New Zealand. So we have wiki leaks and now PBS has been hacked, I am beside myself. Please, no more rumors. Let Tupac RIP! -- His music is what we have to remember him by and his films.